This print version of the page is optimized to print only the content portions of the web page your were viewing and is not intended to have the same formatting as the original page. The National Ground-Water Monitoring Network (NGWMN) is a compilation of selected wells monitoring groundwater aquifers all around the nation. The NGWMN Data Portal brings groundwater data together in one place to provide users with current and reliable information for the planning, management, and development of groundwater resources. The NGWMN network is sponsored by the Advisory Committee on Water Information's (ACWI) Subcommittee on Ground Water (SOGW) and was established in 2009 with a pilot network. The goal of the National Ground-Water Monitoring Network (NGWMN) is to provide information needed for planning, management, and development of groundwater supplies to meet current and future water needs and ecosystem requirements. This will be accomplished by aggregating suitable groundwater data from local, State, and Federal organizations. A consensus-based framework document (https://acwi.gov/sogw/pubs/tr/) was developed to provide guidance to ensure that the data are comparable and can be included in a nationally consistent network. The framework design focuses on providing information needed to assess the quantity of groundwater reserves as constrained by quality. The scale of the network focuses on Principal and Major Aquifers of the United States. Wells in the NGWMN will be designated as being in one of three subnetworks. These are 1) the Background subnetwork, 2) the Suspected Changes subnetwork, and 3) the Documented Changes subnetwork. Monitoring points that provide data from aquifers or parts of aquifers with no (or minimal) anthropogenic effects. These are from areas that have been minimally affected by human activities and are expected to remain so. Monitoring points that provide data from aquifers or parts of aquifers that may have been affected by man's activity, but that is not documented or conclusive. These wells may also be in areas where changes are anticipated. These may be areas with withdrawals are occurring or where land-use has changed, but the effect has not yet been clearly identified. Monitoring points that provide data from aquifers that have documented anthropogenic effects. 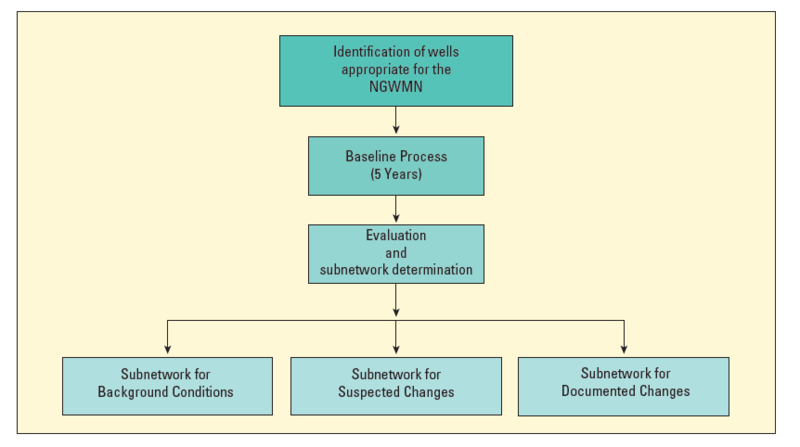 The baseline process is required of all wells to provide or identify an initial monitoring record that is used to place the well into one of the above subnetworks. Five years of monitoring is generally considered adequate to establish these conditions. For existing wells, past data may be used to categorize wells into one of the subnetworks. Wells within each subnetwork (Background, Suspected Changes, or Documented Changes) will be assigned to a monitoring category depending on the purpose of the monitoring at the well. These categories, and conditions at the wells, will be used to determine suggested monitoring frequencies. Trend wells are generally monitored to determine changes over time. The frequency of monitoring depends on the hydrologic conditions of the aquifer and can range from daily data to annual measurements. A subset of the trend monitoring wells will be designated as the "backbone" wells of the NGWMN. Surveillance monitoring would be used in conjunction with Trend monitoring to periodically report on the overall water-level and water-quality conditions, or status, of the Nation's groundwater resources. NGWMN Surveillance monitoring can be thought of as a periodic "census" of groundwater level and quality. An overall snapshot of groundwater conditions in an aquifer is obtained with Surveillance monitoring. The frequency of Surveillance monitoring generally is much less than Trend monitoring. Special studies monitoring is a secondary aspect of the NGWMN. This monitoring is not required and is only provided as an option. Special studies monitoring would be most often associated with the Suspected or Documented Changes Subnetworks and would be used to evaluate the status of ground-water resources at risk, or potential risk, from depletion or impairment. The monitoring frequency would vary, depending on the study. Categorizing wells as special studies acts as a flag to indicate that additional information might be available because wells are measured or sampled for a special purpose regionally or nationally (for example, wells measured to observe the effects of hydraulic fracturing). A pilot phase that started in 2009 initially populated the network with data from 5 pilot networks. These pilots were: the Mahomet-Teays aquifer in Illinois and Indiana, the Cambrian-Ordovician aquifer in southeastern Minnesota, and Principal and Major Aquifers in Montana, New Jersey, and Texas. Following the pilot phase, additional USGS water-level monitoring wells that met the network criteria were added to the NGWMN for some states. In 2015, the Network received funding and began implementation. Eleven agencies were funded to become data providers or to complete work necessary to become a data provider beginning in 2015 or early 2016. These projects are now complete and data connections have been established to all of these agencies data. These states are Delaware, Kansas, Mississippi, North Carolina, Oklahoma, Oregon, South Carolina, and Utah. Data for all these states is currently being served through the Portal. Data for Mississippi is in the process of being added to the Portal and should be available soon. Descriptions of work done in these projects are available here. In late 2015 the Network began the process of funding data providers through cooperative agreements. Current information about the cooperative agreements is availablehere. The Program Board is proposed in the NGWMN Framework Document to provide input into the NGWMN scope and direction and to assist with the evaluation of proposals for funding. The National Ground-Water Monitoring Network Program Board was established in 2015 to assist with evaluating proposals submitted for competitive cooperative agreements. The Program Board is composed of up to ten members. Six of these members are to represent NGWMN data provider agencies. The remaining members are Federal representatives and subject matter experts. Information on the structure and membership of the Program Board are available in the NGWMN Program Board Operating Principles. The USGS National Ground-Water Monitoring Network (NGWMN) offered two competitive funding opportunities for the NGWMN in FY 2016. Funds were available to new data providers to select and classify sites within existing monitoring programs, to set up web services that will link the data to the NGWMN Portal, and to produce a report describing this process. Funds were available to existing data providers to maintain web services and keep site information current. Existing data providers could also receive funding to collect data to improve site information, to maintain wells, and to drill new or replacement Network wells. The projects awarded in both rounds of funding in 2016 are described in this document. The latest round of cooperative agreements is for Fiscal Year 2017. This opportunity closed in January 2017 and awards for this funding opportunity are pending. The NGWMN Data Portal is the access point for information about the wells in this network and for their related lithology (geology), construction, water-level and water-quality data. To access the portal click here. To learn how to use the portal click here. An important aspect of the NGWMN Data Portal is that it is not an aggregated database of data from all participants, but is a gateway to the data which are maintained and served by each participating organization. Original data are retrieved from each data provider by the portal in real-time. The Data Portal has filters and map-based selection capabilities that allow the user to select the sites of interest. After the sites are selected, requests are sent to the contributing databases serving the selected sites to obtain the data. These data are then returned via the portal in graphs and tables and can also be downloaded for later use. Queries can be made on network type (Water Level or Water Quality), well classification, and monitoring category. Sites can also be queried based on Principal Aquifer, type of data available, contributing agency, and state/county. Disclaimer: Please note that this is a beta version of the NGWMN Data Portal, which is still undergoing development and testing. Should you encounter any bugs, glitches, lack of functionality or other problems, please contact the site administrator immediately so they can rectify these accordingly. Your help in this regard is greatly appreciated. All information published herein is gathered from sources which are thought to be reliable, but the user should not assume that the information is official or final. The NGWMN Data Portal does not assume responsibility for errors, and all information is subject to change without notice. Web service requests may be submitted to obtain data directly and to bypass the NGWMN map interface. Currently only basic site information and water levels are available through web service requests. For full site information, lithology, construction information or water quality data visit the NGWMN Data Portal. For more information on the NGWMN Web Services, see the Web Services Guide. The National Ground-Water Monitoring Network (NGWMN) is a compilation of selected groundwater monitoring wells from Federal, State, and local groundwater monitoring networks across the nation. The following agencies are currently contributing to the NGWMN. The agencies listed below are currently providing data to the NGWMN. Information about USGS cooperative agreements to fund data providers is available here. The National Ground-Water Monitoring Network focuses on Principal Aquifers. Principal Aquifers are defined by the USGS in the Ground Water Atlas. Tip Sheet on Defining the "Subnetwork"
A spreadsheet showing the suggested density of water-level and water-quality sites by state and Principal aquifer is available here. The NGWMN Well Registry Management System can be accessed here. If you are a USGS employee, you can access it here. The NGWMN is actively seeking data providers for the Network. Data providers work with the USGS to set up connections between their databases and the NGWMN Data Portal to pass data to the Network as needed. The data providers also work with the USGS to select and classify wells for the Network. Information on a funding opportunity available to assist state or local water-resource agencies in becoming data providers is available here. Other federal, tribal, educational, or private agencies or organizations which have groundwater data to contribute can also become a part of the Network. Contact the ACWI Subcommittee on Ground Water (SOGW) to find out about becoming a data provider.